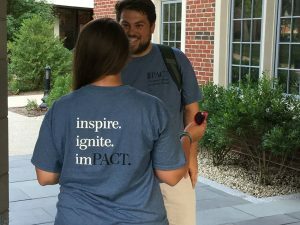 Applications for our next PACT cohort are open! Earn a tuition-free Master’s degree while serving students in PreK-12 Catholic schools. See the Application Instructions for details regarding the application process, and please contact the PACT office with any questions. We are happy to help! December 1, 2018: Application opens. February 1, 2019: Soft deadline. Interview and placement process begins. March 1: Final deadline for applications. May 1: School placement process concludes. May 28: First-year summer program begins with arrival at Providence College for orientation retreat. July 27: Summer program concludes. Teachers depart from campus. August: PACT teachers report to their placement schools for new teacher orientation as directed by their principals. Your PACT application consists of the online application, linked below, and the supplementary materials listed. See the application instructions for full details on each of these components. In addition to the online application, applicants submit the following materials via e-mail to pact@providence.edu. Please see the Application Instructions for full details regarding these materials.